dinner, daily : 6.30pm to 10.30pm. 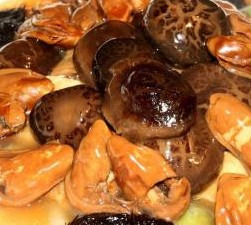 GRAND Millenium Hotel’s Lai Ching Yuen Chinese restaurant has prepared delectable dishes to start the Year of the Dragon. Chef Leong Weng Heng has also come up with fresh yee sang sets perfect for those dining in or as gifts. Among the festive dishes featured are Salmon, Giant Clam, Crispy Fish Skin and Sliced Abalone with prices starting from RM58++. 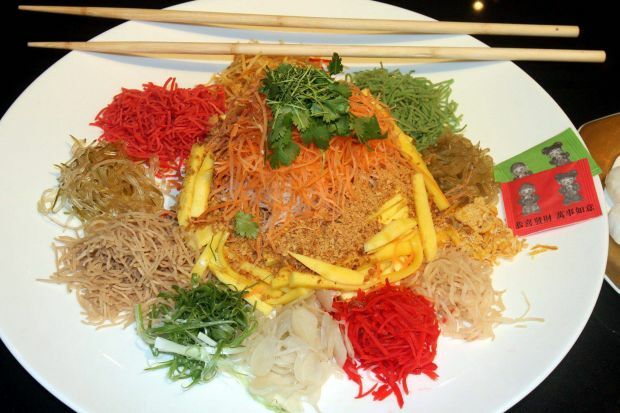 The Prosperity Yee Sang with fresh scallop, mango and crystal pear is a must-try and comes with strawberry sauce. “The strawberry sauce adds a certain zeal and freshness to the flavour,” said Leong. He added that plum sauce could be a tad too sweet hence he decided to add the strawberry sauce to balance the flavours. The dish is priced at RM118++ for half portion and RM228++ for whole portion. Next on the menu was the Braised Duck with Sea Cucumber and Black Sea Moss, a finger-licking dish that was perfect because of the tender duck meat coupled with the crunchy sea cucumber and black sea moss. Good to the last bite: The Lak Zi prawns was a delightful addition to the menu with its crispy crust. The marinated duck is fried till golden brown to lock in the moisture. Then the duck and the sea cucumber are braised with a special marinade for two hours or until the meat is tender. “Sea cucumber and black moss also represent happiness and prosperity respectively so we decided to combine both,” said Leong. Another must-have dish is the Sweet and Sour Pork Ribs. According to Leong, they chose meat with layers of fat and meat, so the fat would help to tenderise the meat during the slow two-hour braise. The Lak Zi prawns was a delightful addition to the menu with its crispy crust and sweet succulent flesh once peeled. Juicy creation: Different types of mushrooms in a tasty broth. Some of the main ingredients of the prawn dish were ginger, onion, garlic, chilli, ketchup and chilli sauce. Claypot rice with waxed meat is always welcome at a reunion table and Lai Ching Yuen has imported the sweet waxed meat from Hong Kong for this special occasion. For dessert, try the Red Bean Puree with Glutinous Rice Dumpling. “Red bean soup is a traditional dessert and by adding the dumplings, which is tong yuen in Cantonese, signifies tuen nien or reunion. Red bean also aids in blood circulation,” added Leong. 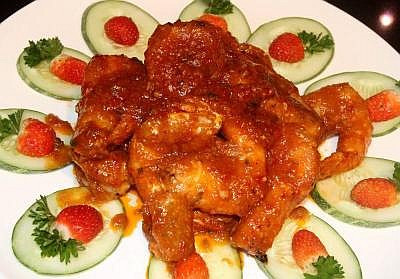 Menus are at RM1,280++, RM1,480++, RM1,680++ and RM1,780++ and serves 10 persons.